Home › Energy-Efficient LED Lighting › Enabled 16.4Ft Rgb Color Changing Kit With Led Flexible Strip Controller With.. 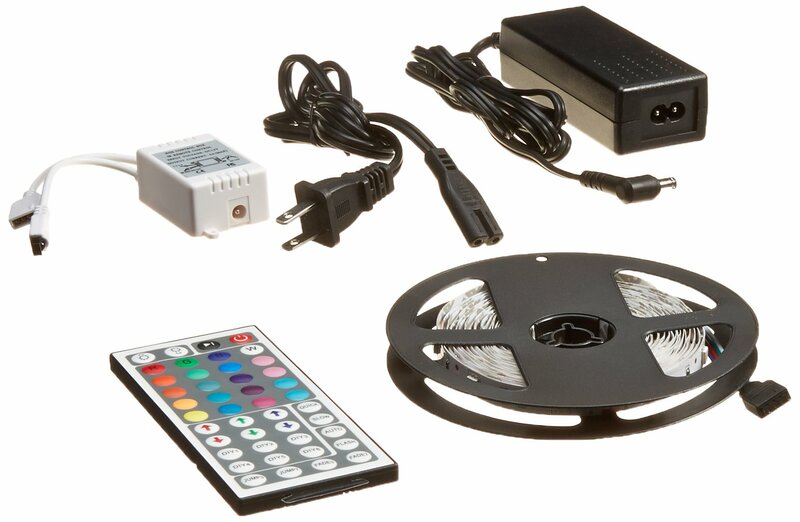 Enabled 16.4Ft Rgb Color Changing Kit With Led Flexible Strip Controller With.. LED Type: 5050 SMD Color: RGB Protection class IP20 (Non Waterproof) LEDquantity: 150 LED/16.4 ft Operating voltage: DC 12V Working Current: 2A/5Meter Output power: 24W/5 Meter Viewing Angle: 120 Operating temperature:-20 to 50 Size: L500cm (5M) W1.00cm x T0.25cm Source life: > 50,000 hours12V 2A Power Supply: Input: 100-240V AC 50/60Hz Out put: 12V 3.0A Cablelength: about 110cm US Plug 44 Key IR Remote Controller: Connection mode:Common Anode (+) Input: 12V Output: 12V Max load current:2A each color WorkingTemperature: -20C-60C Control box dimension: 50mm x34mm x22mm Remotecontroller dimension: 124mm x 56mm x 6mm Remote controller battery 3V:1xCR2025 On: Turn on Power. Off: Power off. Up: increase brightness. Down:decrease brightness. R: change color to red. G: Switch to green color. B:change color to blue. FLASH:color changing automatically, quickly jump.STROBE: automatically change color, gentle jump. FADE: automatic color change,gradually move quickly. SMOOTH: automatic color change, gradually movesmoothly. 8 Light Pattern: Quick / Slow / Auto / Flash / Fade7 / Fade3 / Jump7/ Jump3.